Recent spot illustration for CityPaper by me. Today I’m going to revisit the topic of making money with “Spot Illustration”, how much to charge, where this type of work can be found or how it may even go about finding you. I suggest downloading a copy of the original ebook over yonder to familiarize yourself with the topic even more. DISCLAIMER: Before we get too deep here, I want to re-emphasize that this information is not for beginners. See? I even put in bold. While your art doesn’t need to be super perfect to get paying jobs, you do have to be polished and professional enough and know how to perfect your own style or shift between styles. You can only do that by drawing every single day. Some days, draw ALL day even. But maybe you’ve never had a paying gig before in your life? That shouldn’t stop you either. You have to start somewhere, so don’t just sit on the fence forever, and don’t undervalue your artwork or yourself when it’s time to give a quote. This is by no means a guarantee you’ll find this type of work or make money doing it, only that it does indeed exist, and how you may go about pursuing this avenue for your cartooning, etc. Pro-Tip #2 is… get your own website setup. While a facebook page or free site may work for you, you’re not going to be taken as seriously. I suggest Dreamhost, they have pay as you go pricing or you can save a lot by signing up for annual plans too. Another biggie for new folks is, they have “one click” installs on WordPress sites, so you can have a site like the one you’re reading now up and running in no time. Great for showcasing your portfolio of art and getting great SEO out of a great WordPress install. Here’s a link. Thank me later. Spot Illustrations are small, usually stand alone drawings used in a variety of media to spice up articles or overall design of publications or products. I would say these are the types of drawings that should take no more than 1-2 hours of time to complete. You would want to keep an hourly rate in mind of anywhere between $50-75 when coming up with your quote. And that’s actually on the LOW end. 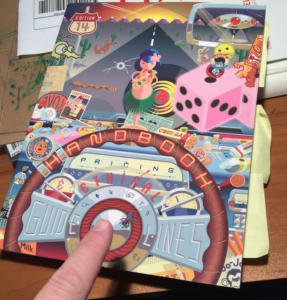 I highly suggest that EVERY cartoonist I know pick up a copy of the Graphic Artists Guild Pricing and Ethical Guidelines. It will be an invaluable reference guide for you and lists illustration pricing charts from everything from working with local weekly newspapers to working on storyboards for motion pictures. Now, in the handbook prices for “Spot” illustration can range anywhere from $50 – $850! So what the heck do you charge?! : What I suggest doing is first figuring out what your hourly rate is. Ask yourself, what do you want to make hourly when your pen is touching paper to make a cartoon. Please, for the love of god, don’t say “I’ll work for $15 an hour!” – remember that being a cartoonist or illustrator is a TRADE. It’s a skill that you’ve trained yourself to do, and in some cases tons of college education. So please think more along the lines of $50 an hour AT LEAST. That’s the low end. That would mean that if you were thinking you could bang out a small illustration for a blog within an hour, you can safely charge that blogger $50 for the spot art and you’d be happy. Some would even say that price is undervaluing your art. I guess it depends on where you are in life and your career. I’ve done spot art in the past for as low as $25 a pop. But these days my rate is generally something around $150 an hour. It’s completely up to you. Here is a pretty great guidefrom designer Jessica Hishche “How much to charge for your design work” While that’s not directly related to rates for spot illustration it IS a great way to train your brain to work when quoting jobs. What if there’s a job you’re not incredibly enthused about doing, but you’ve been asked to quote. I suggest bidding the job high, maybe even DOUBLE what you normally charge. You’d be shocked how many times I’ve done this and the client actually said “Sounds great!” – It really makes you rethink your rates, that’s for sure! And suddenly drawing that thing you weren’t enthused or passionate to draw is totally worth it. What we’re up against. There have always been worries by colleagues in cartooning about pirate cartoonists undercutting other prices and hurting the overall value of what we do. But even six years ago when I wrote the ebook, we didn’t have something like FIVERR around, where you can totally go hire someone (probably in a sweat shop in the Philippines) to draw you doodles for your blog for $5. They make about $4. It’s insane. BUT, I also believe you get what you pay for. Colleagues of mine used to complain about google image search and clip art services undercutting them, but now you have serious sweat shop things going on in other countries. 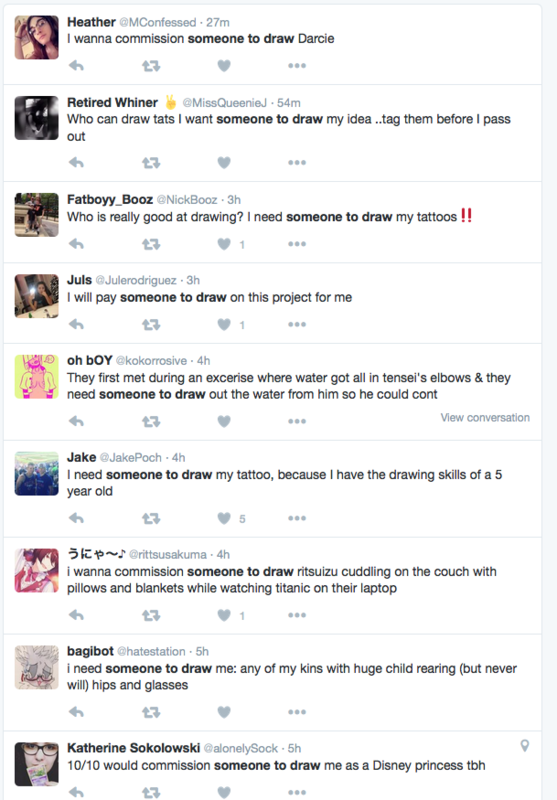 Some of those listings will even say “WILL DRAW WITHIN 4 hours!” – THAT is what you’re up against. Scary, huh? The good news is…. 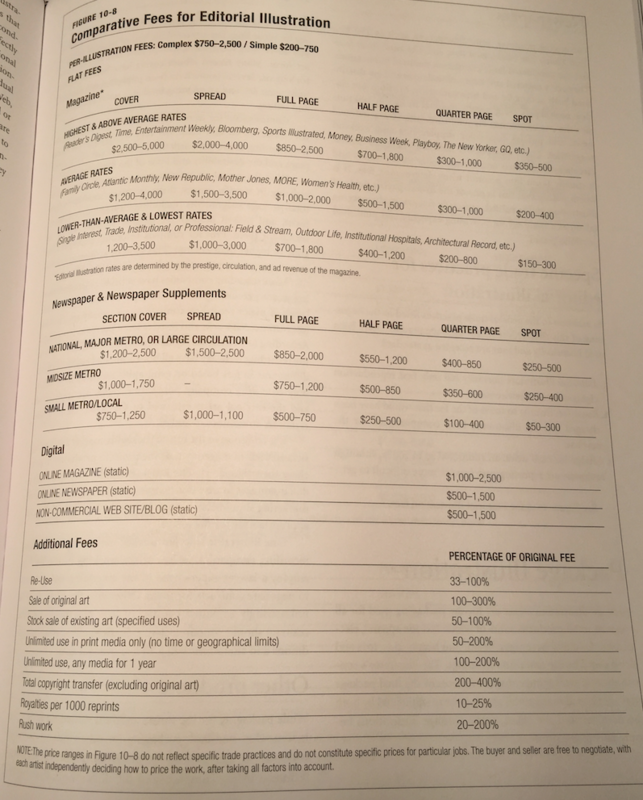 reputable print publications (print still exists!) and bloggers and online media and publications who want to be taken seriously are not going to be using FIVERR or other clip art sweat shops. Professionals know to build working relationships with other professionals. Another tip I gave in the original ebook was building up your own “ready to order” drawings of differing topics. Basically your own “clip art’ but all drawn in your unique style. Charge $15-20 for a one time use and then offer the full price if someone wants it exclusive, so essentially they can buy it off the site so nobody can use it every again for $200 or $300 bucks. I’ve seen a few clever cartoonists doing something similar. Taking your spot art to the next level. Cartoonist Brad Fitzpatrick seems to be a master of this. http://www.bradfitzpatrick.com/ He’s put a lot of work into his site over the years. Think about it this way…. 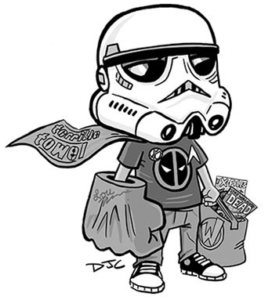 on one section of his site he has a selection of cool mascots for schools, Bulldogs, Eagles, Panthers, all drawn in his unique style. Check out this Bulldog. Pretty badass. I bet a bunch of schools with bulldog mascots have thought so too. Every time it’s downloaded, he makes 18.95. Now I have no idea how much he’s made off one illustration over the years, but even if that one picture of a bulldog was downloaded 20 times, he made $379 drawing that one pose. And he’s “scaled” it. He offers multiple poses, multiple animals. Even if this part of his freelance income is just the “side” surprise money for him, it’s smart. Disclaimer: I have not spoken to Brad Fitzpatrick, I only use him as an example to hopefully inspire others. BUT, now that i’m thinking about it, maybe it would be a great idea to do a little mini interview with him for the blog. If you have any topics you’d like covered, toss them in the comments! 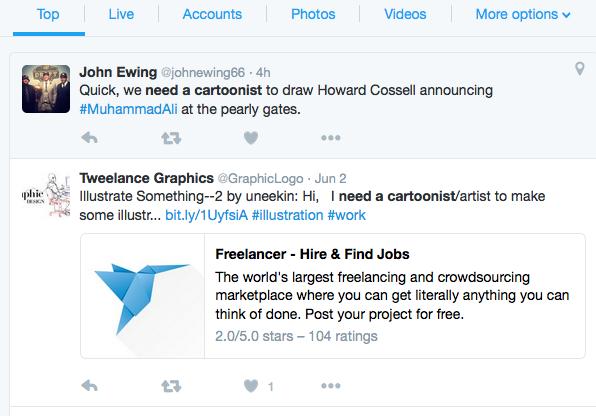 How to find Spot Illustration Jobs… let’s go fishing! One of the tips I wrote six years ago in the original ebook was to use “Twitter Search” and search for phrases in quotes like “iPad Reviews” or you can even get super targeted and find people looking for art. So maybe that’s not how people really “talk” online. Maybe they simply say something like “I need someone to draw me a tiger!” – But I’m gonna search in quotation marks just “someone to draw” and look what I get…. LEADS. LEADS. LEADS. All over the damn place. Now, this is pretty vague I know. And those aren’t publications or bloggers, just REAL people wanting things drawn. It’s the type of way you should train your brain to be thinking when generating leads. Maybe you could contact these people blindly with a link to your website samples. When I was a creative career coach I would tell all my clients they need to do this stuff EVERY DAY. Just like exercise. Even just 10-15 minutes of your day. This strategy is used by many editors, marketers and creative hustlers to also FIND YOU and many other things. If you had a solid website (like i mentioned way above) and social media presence and hashtagged your work well, chances are an editor or someone from out of the blue is going to get in touch with you. So make sure your site or social media is setup to be easily accessible and people know how to quickly contact you. Don’t be a recluse! Another possible situation you may consider is to work proactively. Find topics that are JUST happening and big news, things people are going to be blogging about. Draw up the best picture of the topic, then go jam to social search on not only twitter but Instagram and SEARCH HASHTAGS. Then find contact info for whoever is writing the blog and ask them if they’d like to use your art in their article at such and such a price. Take a look at that top comment from Twitter search…. Muhammad Ali just died and they wanted someone to draw him being announced by Howard Cossel at the Pearly Gates. If you’re competent cartoonist you could have had that comped up in under an hour and connected with whoever that is. Even if that guy declined, I bet you could find another article online to run your spot illustration in a non-exclusive way for fifty bucks. In most cases, doing work for free up front is pretty evil, but not in ALL cases. When you’re just starting out, perhaps you would do the above and find some cool bloggers to team up with who would use your art in their articles and attribute it to your website. Then in this way you can also build up a working catalog of art you’ve done that is being used by publications. It builds up credibility in your work. Especially if you have a distinct style going on. I hope you’ve found this post inspiring in some way! If you did, please feel free to share it with others on your social media of choice. And if you have ANY questions at all, feel free to comment here and we can have a conversation in the comments section. Grab a download of the original ebook. Next up…. I’ll cover #2 Digital Caricatures. Hi DJ, I have been freelancing my whole life and found that bulldog download an interesting idea. Do you have more to share on this? It may be a great way to go into retirement someday.